In a little more than an hour, with his cello as his only means of expression, Matthieu Saglio creates with Cello Solo a universe inhabited by an artistic vision that is rich and sensitive, as if it dealing with musical northern lights. Cello Solo is the result of a long maturity, an accumulation of the multiple experiences of the musician. Matthieu Saglio combines classical tradition where Cello Solo’s roots are buried, with sounds and rhythms brought from his encounters across the world. In his compositions, you can hear resonating echoes from the Western cathedrals and souks of Maghreb, the Latin-American tango and the Iberian flamenco. Cello Solo is a thread plaited with patience, like a unifying tie between the artist and the audience. It is a thread that vibrates with a thousand emotions during a magical silence. A thread that crosses the musical pages of an unclassifiable notebook that is humble and moving. Cello Solo live is about a musician and his cello. The sampler’s magic permits Matthieu Saglio to be recorded live to create a dialogue with himself through the means of his virtual alter-ego. A base line, with airy pizzicati and a motif with the bow… Matthieu Saglio builds an original and elegant architecture during Cello Solo, without letting the technique have priority over emotion, it is omnipresent. Cello Solo exists as instrumental version or with the unmistakable voice of Emilio Garrido, the well-known presenter of Radio Nacional de España-Radio3, with texts extracted from his novel “Aire de Fuga”. 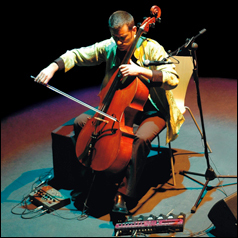 The launch of Cello Solo took place in Madrid (auditorium Conde Duque) and Alicante (Teatro Arniches) at the end of February 2009. Since then, Cello Solo has been touring all this time in numerous places in Spain, France, Portugal, a lot of time in Churches. Live album recorded in February 2013 in the mythical Corral de Comedias in Alcalá de Henares. This album contains Emilio Garrido's texts and some new compositions which were not on the first album. This album is available exclusively on www.matsag.com. The original Cello Solo studio version, recorded in 2009 with the cello as the leading role but the songs are enriched thanks to the possibilities the recording studio offers. The release of Cello Solo in the Arniches Theatre in Alicante in February 2009 has been recorded live on DVD.